It’s many years since ‘The Good Life’ was first shown on television, but growing your own and ‘self-sufficiency’ is making a real come-back. 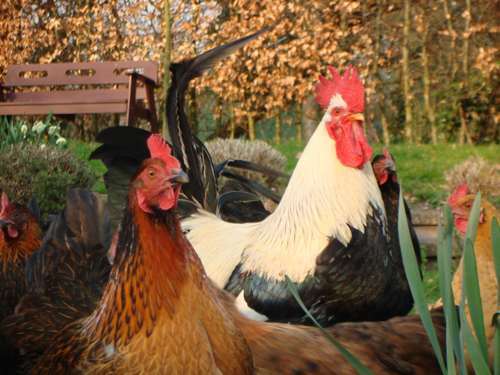 Many of us are aware of long waiting lists for allotments, but did you know that keeping chickens is also becoming increasingly popular? And now that most of us are aware of the problems of battery hens, it’s a good way to make sure that your eggs are always fresh and free range. You can even give a home to ‘spent’ battery hens, who will, despite the name, continue to provide you with fresh eggs for several more years beyond the end of their battery life. And you don’t need that much space, either. In fact, having an allotment and keeping chickens often go hand in hand, as an allotment provides plenty of room to keep chickens. So what will your chickens need? Well, first of all, they’ll need a run which is thoroughly predator-proof. It needs to be able to keep out foxes, in particular, but also cats and dogs. You can buy chicken coops and cages online, and also find plenty of advice about making them predator-proof. It’s rather beyond the scope of this article, so let’s just say that you can use chicken wire, but it needs to be at least six feet tall, and also buried to a depth of about 30cm. A better option might be to invest in some electric fencing, which is a much more reliable deterrent, although it does require some setting up and ongoing maintenance. You’ll also need to supply your chickens with something to go on the surface of their hen run. Wood chip or bark chippings provides the ideal surface for chickens, as it gives them something to scratch about in, and all sorts of insects like to live in it, which the chickens will be able to eat. You can buy wood chip from bark suppliers, but do remember that you’ll need to buy untreated wood chip, to make sure that it’s safe for your chickens. You can often buy it in bulk to save having to keep ordering, and to make sure that your chickens never run out. And it’s not just perfect for chickens either, as you can also use it for making paths and generally as a surface around the garden and allotment. Check out our Chicken Chip products for more information and prices. Your chickens will also need a good supply of water, and some feed. You’ll need to visit them every day, to make sure that they have enough food and water, and also to collect any eggs. At the same time, you can make sure that the run is still predator-proof, and that your chickens don’t need anything else.